The most important thing is to place your forefingers in the middle of horizontal row. For QWERTY keyboards that would be keys "F" and "J". 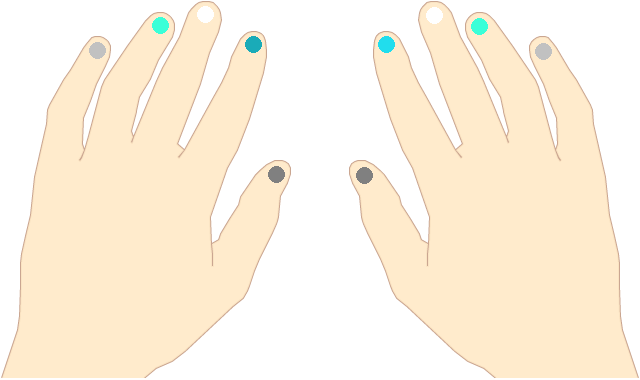 The rest of fingers (except for the thumb) should be placed along the "home" row. During touch typing you reach other keys starting from the base position. You do not need necessarily come back to the base position, after a key has been pressed, although, your forefingers should keep their base position whenever possible. It is also important that your arms and hands are arranged in a natural way. Do not try to stretch them for typing! You should not lay your hands in a "rabbit fashion". If you feel somehow uncomfortable during typing, change your position so that you do not feel any inconvenience. Although the correct approach is not obvious and seems less popular, we want to teach you it. It is just more comfortable for your hands.